The Administrative Assistant is currently vacant - If you're interested, please apply! This position is the first person that will greet you as you walk into the Curyung Tribal Offices. The Administrative Assistant assists Tribal Members and others with various applications, faxes and copies, tribal cards, and anything else that is needed. He also assists the Tribal Administrator and other Curyung Tribal Council Staff with their programs. The assistant is available to assist tribal members as they enter the door and with faxes, tribal cards, housing applications, scattered sites applications, tribal membership enrollment, tribal verifications, tribal court petitions, or finding any additional services that may be applicable to them. 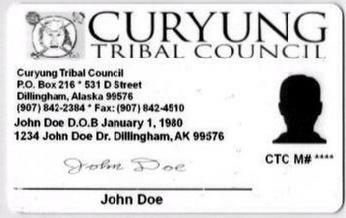 The assistant issues the Curyung Tribal Council tribal membership I.D. cards. These I.D. cards are accepted as a form of identification for such institutes as a Bank, Medical Health Services, and Air transportation. As of 2011 they are also accepted by the Social Security Administration. The Bristol Bay Housing Authority, Bristol Bay Area Health Corporation, Alaska Native Medical Center, Indian Health Services, Bristol Bay Economic Development Corporation, Bristol Bay Native Association, Bristol Bay Native Corporation, various School Districts, Colleges, and Vocational Schools require Tribal membership verification in several different forms. It is my responsibility to provide proof of tribal enrollment to any institute or organization that requires it to obtain services. Victrina is able to assist tribal members in our community in Public Assistance applications, Housing applications, B.B.N.A. General Assistance forms and BBEDC residency forms. For tribal members outside of the community, she can help find information in their areas that will allow them to get their tribal benefits and assistance. Other job duties include assisting all program managers (Tribal Chiefs, Tribal Administrator, ICWA Caseworker, Housing, Environmental Coordinator, Accountant, Tribal Court, and on a needed basis for filing, typing, creating filing systems, organize offices, making copies, faxing, postings, regular monthly meeting council packets, taking and transcribing minutes for the Curyung Tribal Council Meeting, ordering supplies, checking, sorting, and distributing mail, and any other duties as assigned.